I believe this to be a trials item which was never produced in number. This is not uncommon with the Tantalus line of kit. The hood is a generous size with wire for shaping. The hood can be adjusted by making the face-hole smaller, but you can also adjust the the hood at the back, to keep it away from your face should you require it. Great militaria collectable. "Utrinque Paratus". Genuine UKSF issue MWD/GP dog muzzle Bridle leather, quality fixings Well used but fully functional, been painted in its life with novelty "teeth" sure it would come off with some thinners What you see is what you get, genuine issue...can just make out the issue stamp on second picture Please allow a few working days for dispatch of this due to a busy work and home life, if you need it sooner please enquire.... Have a look at my other items, having a big clear out!! Cheers! A lazer scan print of the famous Iran Embassy siege print. This Arnhem flag has the fittings to be hoisted and is made from man made material as is the scarf. Both in excellent condition. UK Special Forces Black Ripstop Trousers Size 34. SO19 security Police vgc. Condition is very good. Size 85cm leg,88cm waist, 104cm seat Features rip stop material, baton pocket, waist tie, ties on bottom of leg. Dispatched with Royal Mail 2nd Class or 2nd class signed for, choose at checkout. • PVC tactical patch with hook and loop fastener back. Genuine Jayjays quad M4 Crye Multicam SF UKSF SAS SFSG New Rare! Genuine Jayjays of Brecon mag pouch great condition Multicam What you see is what you get, genuine issue, ideal for Mollie belt setups Please allow a few working days for dispatch of this due to a busy work and home life, if you need it sooner please enquire.... Have a look at my other items, having a big clear out!! Cheers! British Parachute Association Pin Badge. Condition is New. Dispatched with Royal Mail 2nd Class Large Letter. 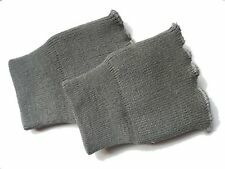 British Army Special Forces winter gloves made in Germany, WIZZARD.Highest quality product made from map material, leather and insulated. For sale is a Batton Cross Section 37mm great for Display. NEW ISSUE SAS BERET BADGE. Cap badge, a downward pointing flaming sword worked in cloth of a Crusader shield., worked in the light and dark blue colours of the original No. 11 SAS Battalion. This was converted to a Roman patterngladius when the design was made up by the tailors in Cairo. 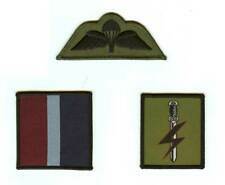 & SFSG (Special Forces Support Group) Badge. Subdued 16 Air Assault Brigade Patch & Special Forces Support Group ID Badge. 16 Air Assault Brigade TRF/DZ Patch. 'The 16 Air Assault Brigade'. Subdued Parachute Trained Para Wings &. Small and light but life saving. • Strobe can be used in the visible white light mode or Infra red mode (with filter cap fitted) or with blue filter fitted (distinguishes from ground fire). • With IR Filter fitted, Strobe is only visible through a IR Night viewing device/goggles. Genuine British Royal Navy /Royal Marines Heavy Duty wooden step / box. They have Royal Navy and Royal Marines stenciled on the top of them in blue and green. 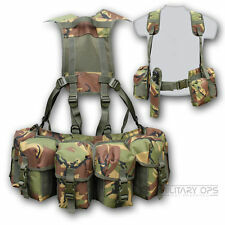 BRITISH PARATROOPER PLCE DPM WEBBING CUSTOMIZED RARE !!!!! A unique paratrooper's set of webbing. Bullet lighter cases are hand made in the UK by Greenzone®. 'AMPHIBIOUS ASSAULT' Combat Jacket/Shirt TRF Patch/Badge. Olive Green/Black TRF Patch/Badge. Royal Marines Commandos. 'AMPHIBIOUS ASSAULT'. 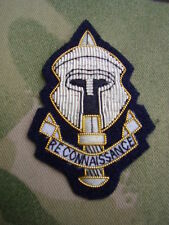 Royal Navy/Marines Commandos/Special Boat Service (SBS). Special Boat Service (SBS). W il l mo st r if le s, sh ot gu ns. Carinthia Hig 2.2 Mtp Jacket Xl. Condition is Used 3 small repairs which I have used mcnett tenacious tape to repair them,Hood is also missing other than that everything works as it should! 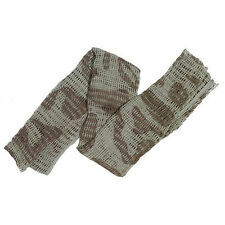 The Cuffs are excellent to add to a Combat Smock or 95 Smock, they can also be sewn onto civilian jackets. Many Forces personal who do not get issued Para smocks buy and attach these cuffs to field Jackets. SAS (Special Air Service) Famous Sand Beret. Famous Sand Beret & Badge. To Your Beret, If That Is The Intended Purpose. The SAS Badge Is Not Attached And Will Need To Be Attached. As Proudly Worn By The Troopers Of The Elite SAS. Operators baseball cap, MTP velcro patches. BLOOD CHIT UK AVIATOR / SPECIAL FORCES! RARE CHANCE TO OWN A UNIQUE & RARE PIECE OF BRITISH MILITARY HISTORY / RARE HISTORICAL DOCUMENT AS ISSUED TO ROYAL AIR FORCE / SPECIAL FORCES UNITS ON ACTIVE SERVICE DURING OP HERRICK AFGHANISTAN! FREE P&P UK MAINLAND ONLY! OTHER POSTCODES / OVERSEAS BUYERS PLEASE CONTACT FOR P&P QUOTE BEFORE BUYING! MANY - THANKS FOR VIEWING! 100% SATISFACTION GUARANTEED OR YOUR MONEY BACK! Cap badge, a downward pointing flaming sword worked in cloth of a Crusader shield., worked in the light and dark blue colours of the original No. 11 SAS Battalion. This was converted to a Roman patterngladius when the design was made up by the tailors in Cairo. SA 80 / M16 Weapons [carrying case] slip. New & Unissued. New and Unissued. Weapons carrying case/holdall, for weapon & its accessories. TRF's, [tactical recognition flash], DZ patches. National Emblems, etc etc etc. All UK orders with accumulative value of over £15. 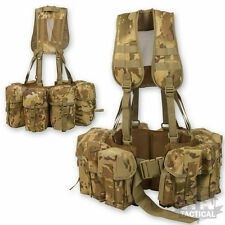 GENUINE BRITISH ARMY UKSF COYOTE TAN L129A1 SHARPSHOOTER SNIPER CARRY/DRAG BAG.